Wall or Nothing is a Simpsons Comic story. 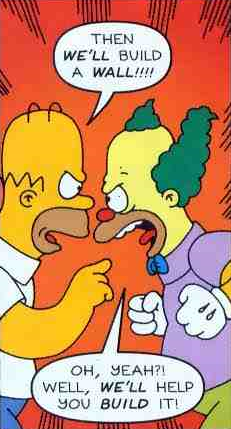 In America and the UK it was released in Simpsons Comics #50. It was also featured in the book Simpsons Comics Royale. The Lake in Lower Springfield is closed so Upper Springfield can use it for water supply. At a town meeting, Lisa reveals that Upper and Lower Springfield were split due to a feud between Jebediah Springfield's sons. The town decides to segregate each other by building a wall. Lower Springfield is the side with water, and Upper is the richer, more snooty side, which is now out of water due to the wall. Lower Springfield now has to substitute for locations they are unable to reach including school and church, however they feel a huge amount of smugness due to Upper Springfield's struggle without water. Milhouse and Bart are stuck on opposites sides as Milhouse is staying with his dad, so Bart hosts a rescue mission. Bart is able to reach Milhouse by breaking through the wall with a bulldozer. After a brief skirmish between the two sides, the town reconcile, forgetting their old problems and the whole town goes skinny dipping. Wikisimpsons has a collection of images related to Wall or Nothing.